Micah Roberts of Crook County Central Christian takes a shot over an Echo defender during the game on Saturday. ECHO - The Echo Lady Cougars defeated Crook County Central Christian White Tigers 46 to 26 on Saturday, February 14, 2009. It was senior day for the Cougars with Ashley Gregerson, Ashley Hodgen and Sydney Swaggart being celebrated for their high school careers. The Cougars dominated play shooting 43% to Central's 25%. 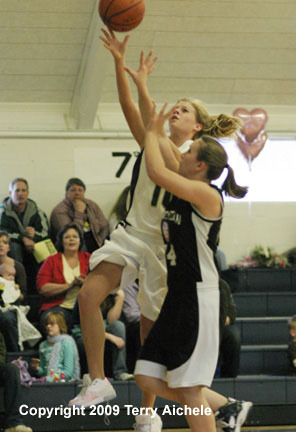 Senior Ashley Gregerson led all scorers with 13 points followed closely by Kristen McCallum with 12. Taylor Tarvin and Shilah Hillard both had six. Senior Sydney Swaggart had four, Sara Reese had three and senior Ashley Hodgen had two. The teams exchanged leads in the first period with Central controlling things in the last two minutes. Echo led 8-4 with three minutes to play and didn't score another point for the rest of the period. Central scored eight to lead at the end of the first 12-8. Echo started hitting their shots early in the second period. The Cougars outscored Central eight to four in the first three minutes to tie it up at 16-16. Cougars scoring on the run included Kristen McCallum, Shilah Hillard and Sydney Swaggart who tied it up at 16. Taylor Tarvin hit a shot at 4:40 to give Echo the 18-16 lead. Echo never gave up the lead for the rest of the game. Echo led at halftime 22-18. Senior Ashley Hodgen hit two freethrows just seconds into the third period to stretch the Cougars lead to 24-18. Moments later senior Ashley Gregerson hit a shot to take the Cougars to 26-18. Other players scoring in the third period included McCallum and Taylor Tarvin. Echo led at the end of the third by ten, 32-22. Central was stuck at 22 for four minutes in the third period and five minutes in the fourth. Cougars scoring in the fourth included Hillard, McCallum, Gregerson, and Sara Reese with a three pointer. Echo won by twenty points with a score of 46 to 26. 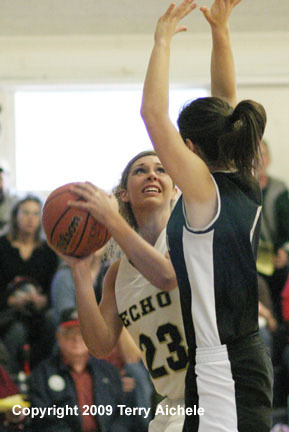 LEFT - Echo's Kristen McCallum takes a shot over Bekah Clements of the White Knights. RIGHT - Cougar senior Ashley Gregerson works her way along the baseline while being guarded by the White Knight's Ashlyn Hanson. 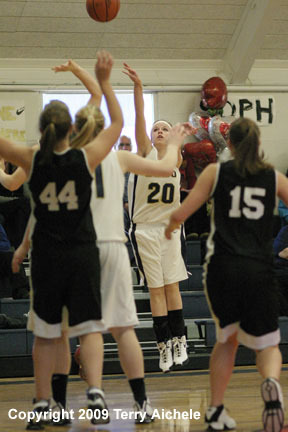 LEFT - Echo senior Ashley Gregerson prepares to shoot a foul shot. 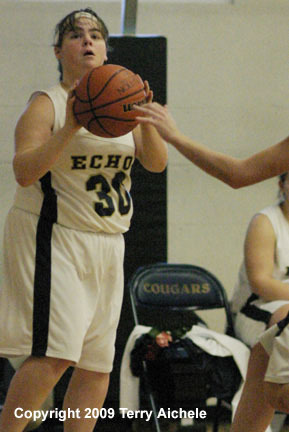 RIGHT - Shilah Hillard of Echo spins to the basket. 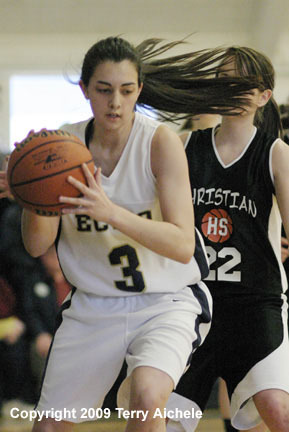 LEFT - Echo Senior Sydney Swaggart of Echo ends up on the floor while battling to control a rebound. 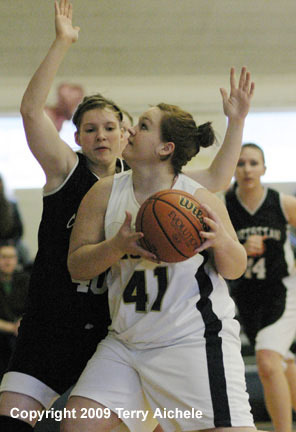 RIGHT - Kristen McCallum of Echo takes a shot while being guarded by White Knight Paula Antonsen. 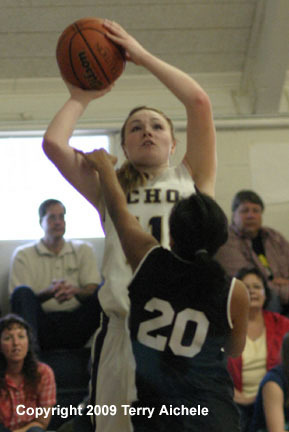 LEFT - Sydney Swaggart of Echo drives to the basket for a layup. 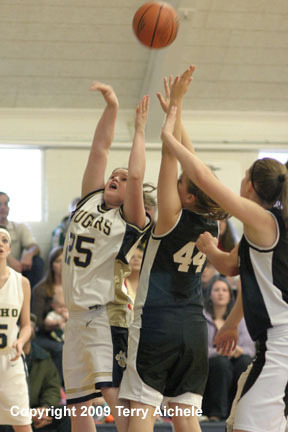 RIGHT - Echo sophomore Taylor Tarvin takes a shot. LEFT - Ashley Gregerson of Echo eyes the basketball while being closely guarded by a White Knight. 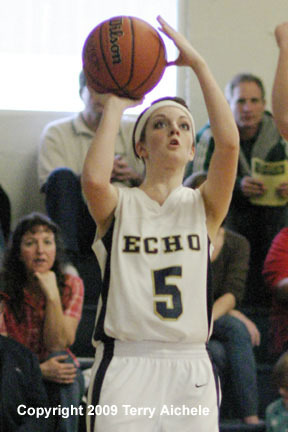 RIGHT - Rachel Round of Echo takes a shot. 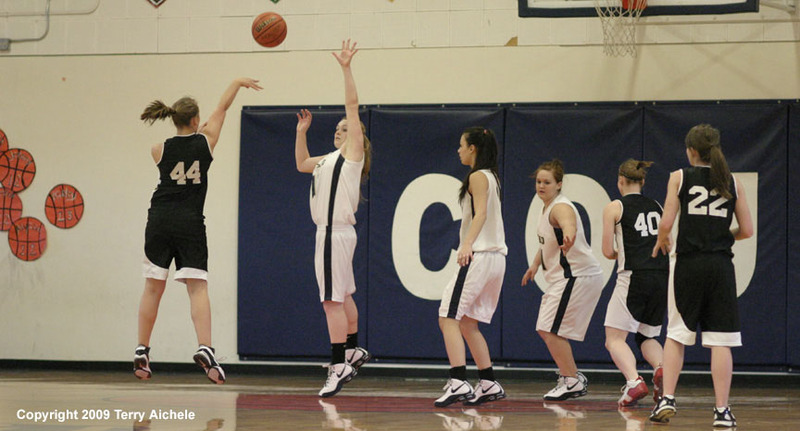 LEFT - Cougar Kylee McAuslan takes a shot over a group of players. 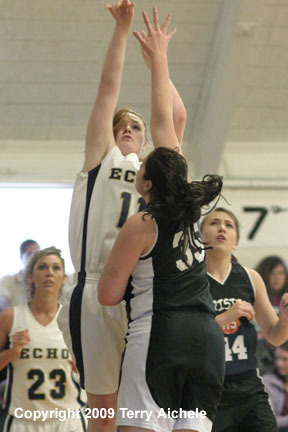 RIGHT - Ryanne Tarvin of Echo comes down with a rebound.